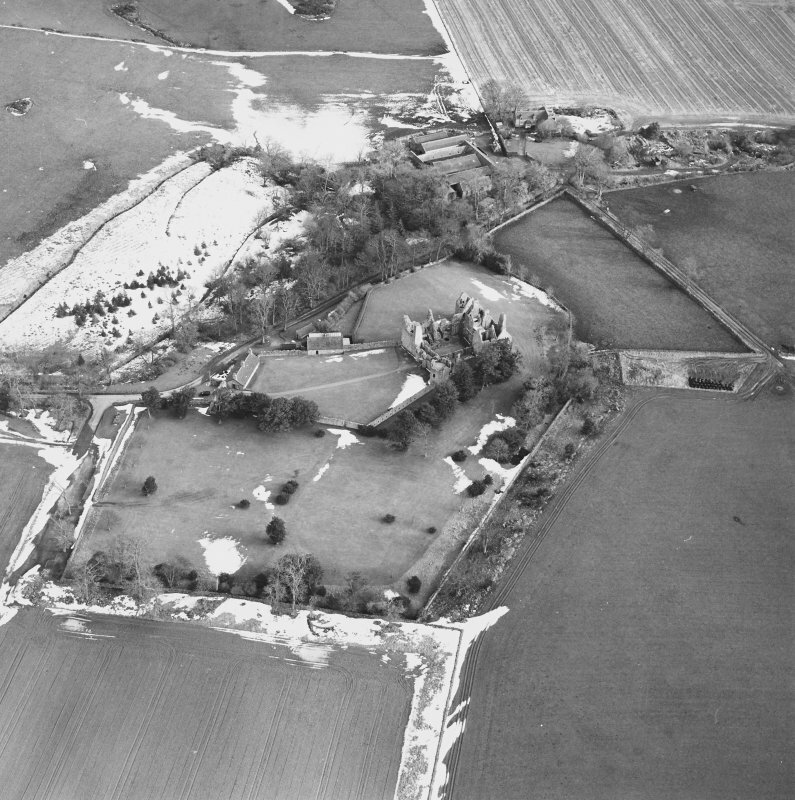 Oblique aerial view centred on the remains of the castle taken from the SE. 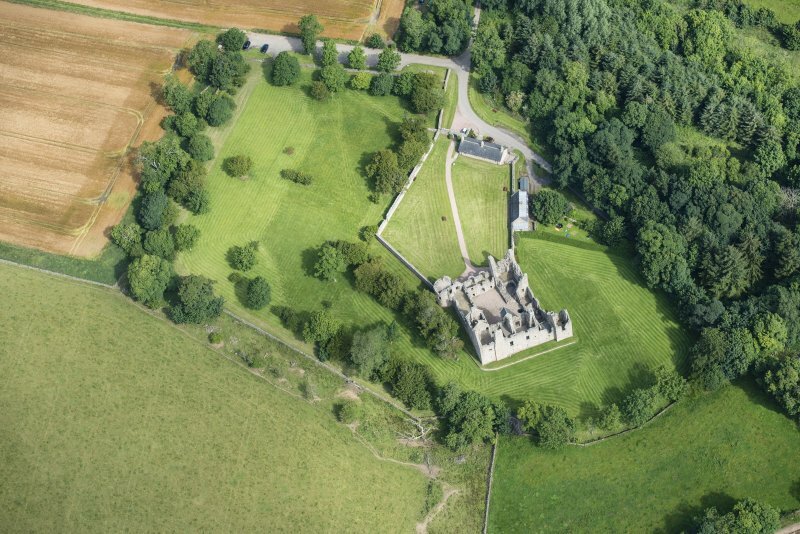 Oblique aerial view centred on the remains of the castle taken from the S.
Oblique aerial view centred on the remains of the castle taken from the SSW. 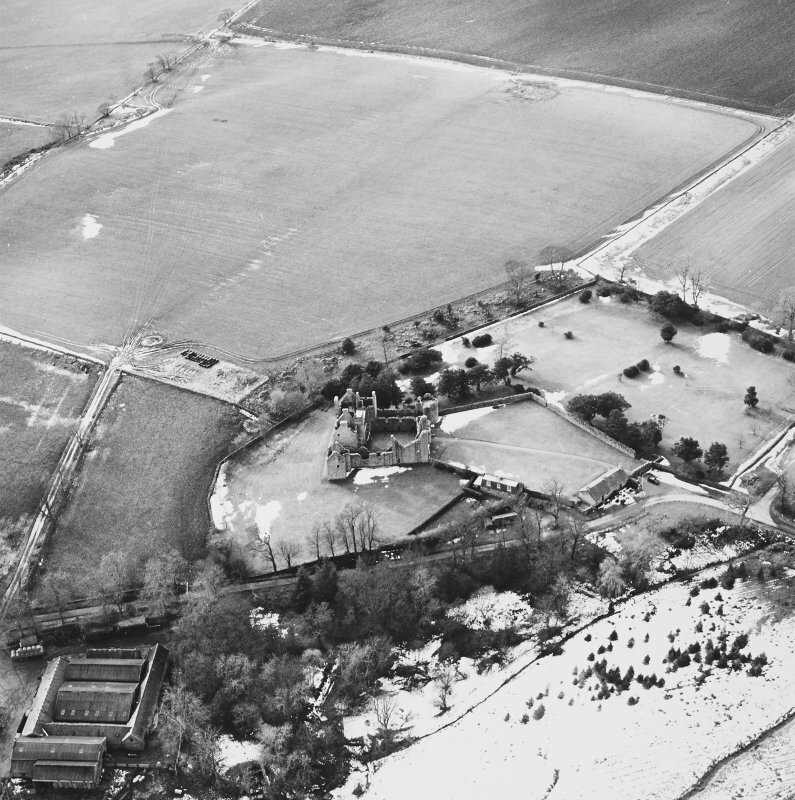 Oblique aerial view centred on the remains of the castle taken from the SW.
Oblique aerial view centred on the remains of the castle taken from the WNW. 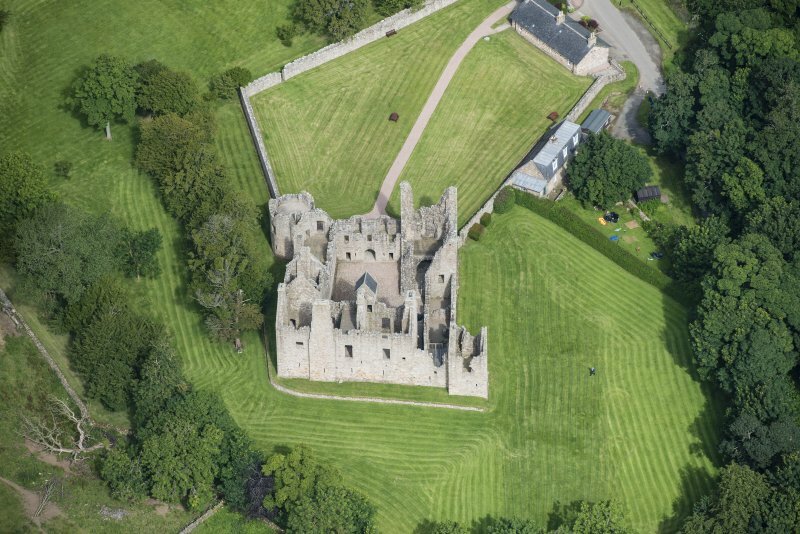 Oblique aerial view centred on the remains of the castle taken from the NE. 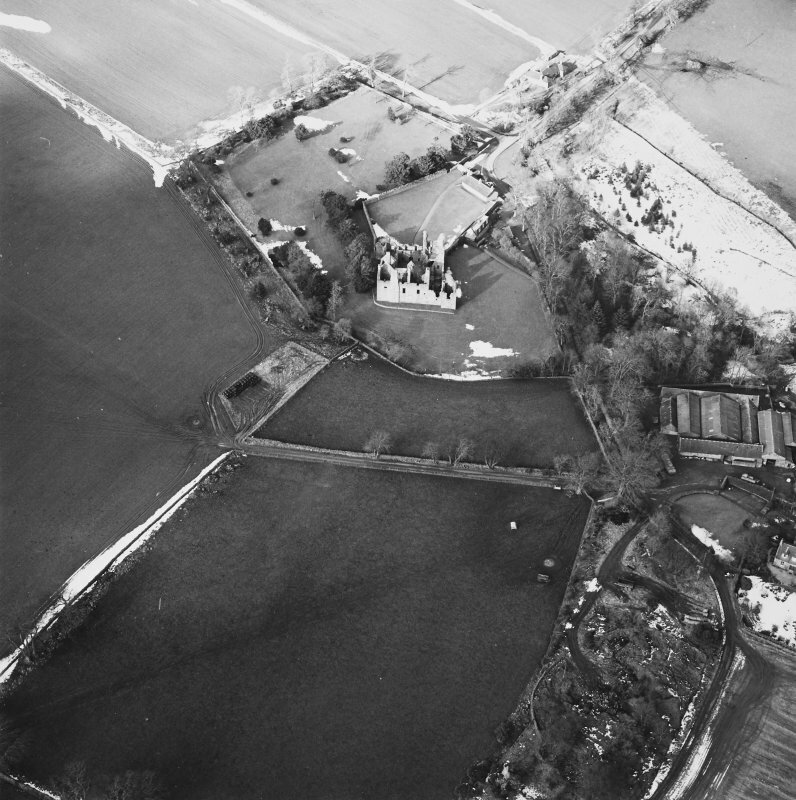 Oblique aerial view of Tolquhon Castle, looking ENE. 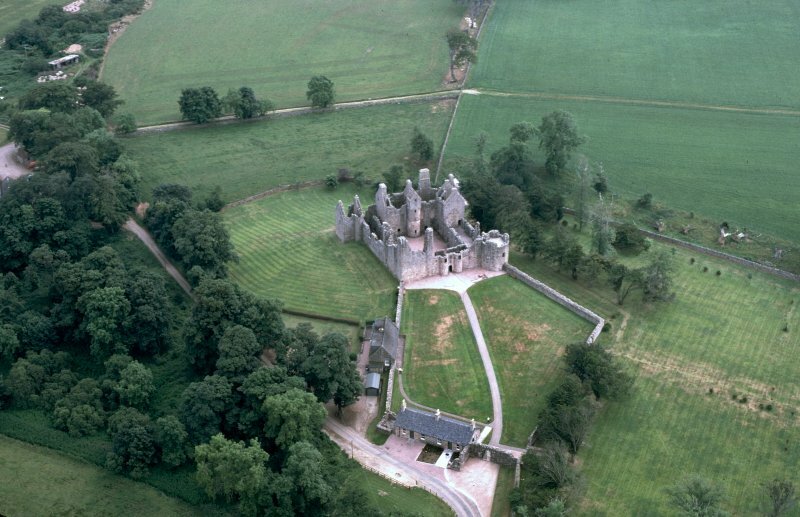 Oblique aerial view of Tolquhon Castle, looking NW. 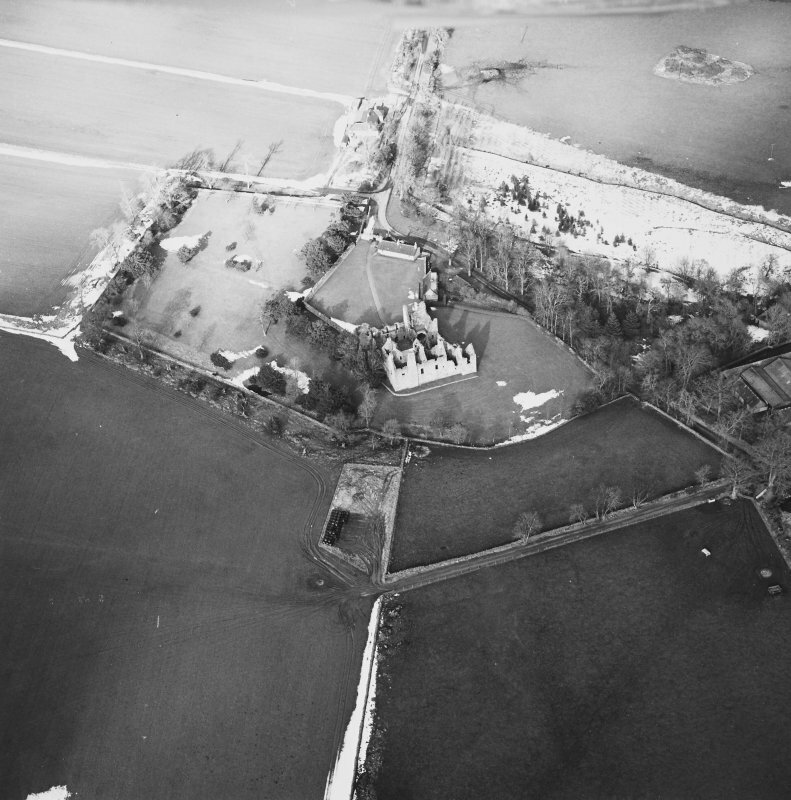 Oblique aerial view of Tolquhon Castle, looking ESE. Oblique aerial view of Tolquhon Castle, looking N.
Oblique aerial view of Tolquhon Castle, looking NNW. View of SW angle of courtyard from wall top. View of entrance gateway from NW. 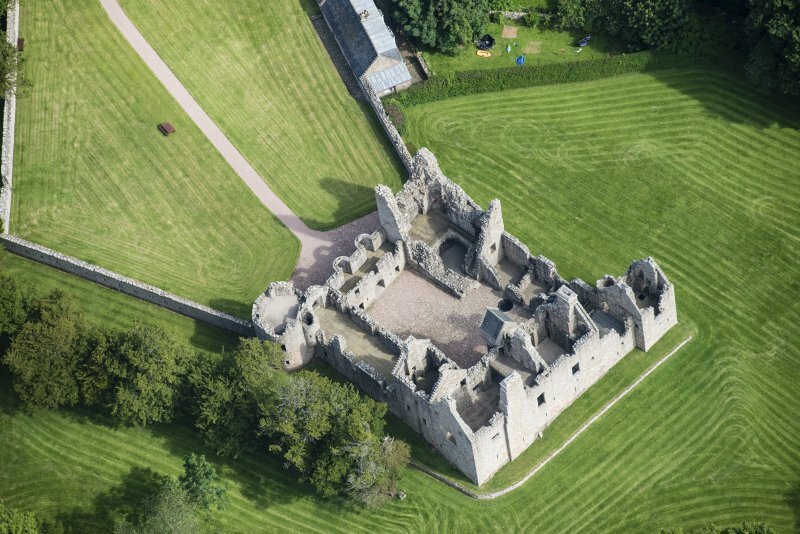 Copy of engraving showing view from N and view of courtyard from W.
Oblique aerial view centred on the remains of the castle taken from the WSW. 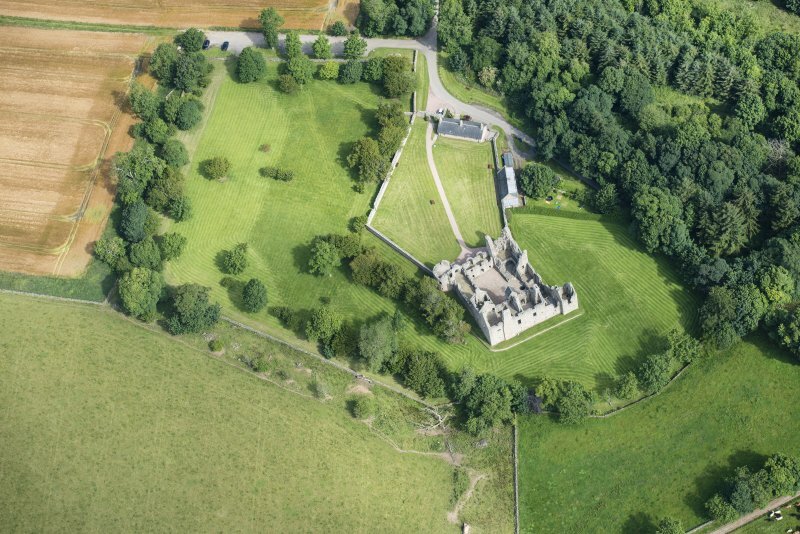 Oblique aerial view centred on the remains of the castle taken from the NW. 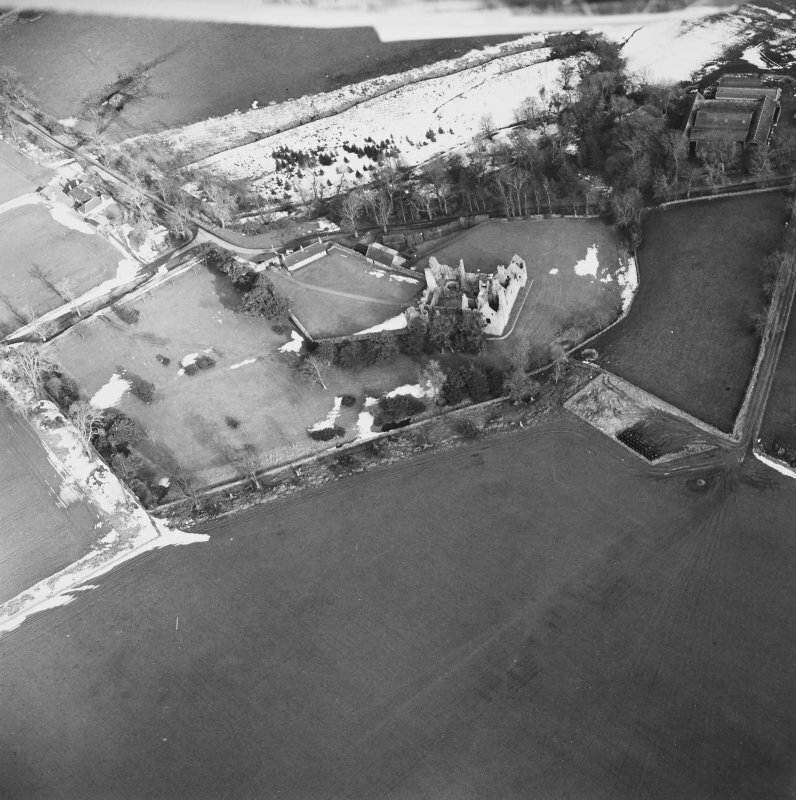 Oblique aerial view of Tolquhon Castle, looking SE. 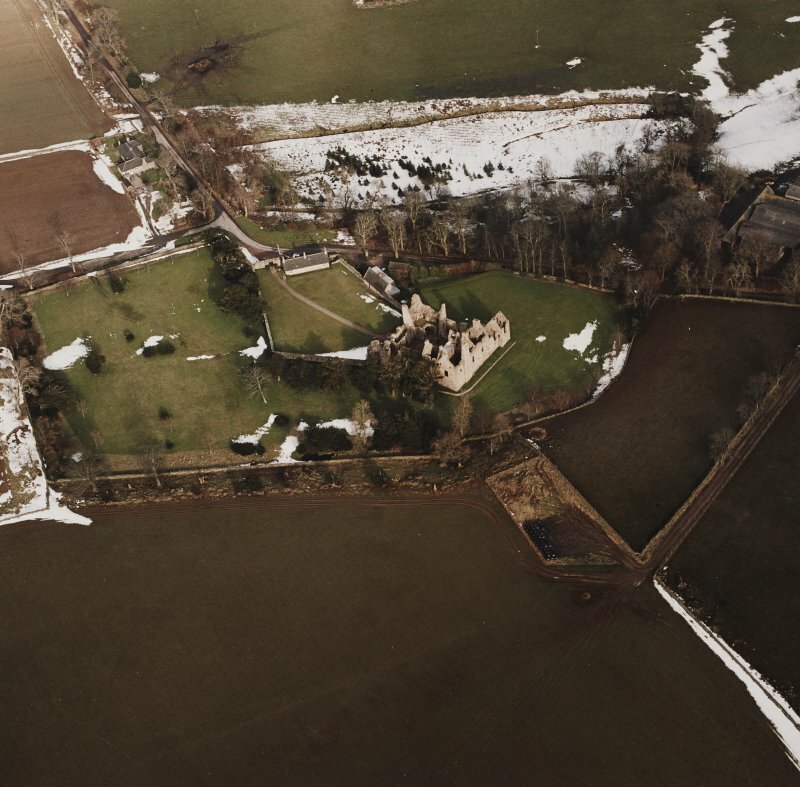 Oblique aerial view of Tolquhon Castle, looking SSE. 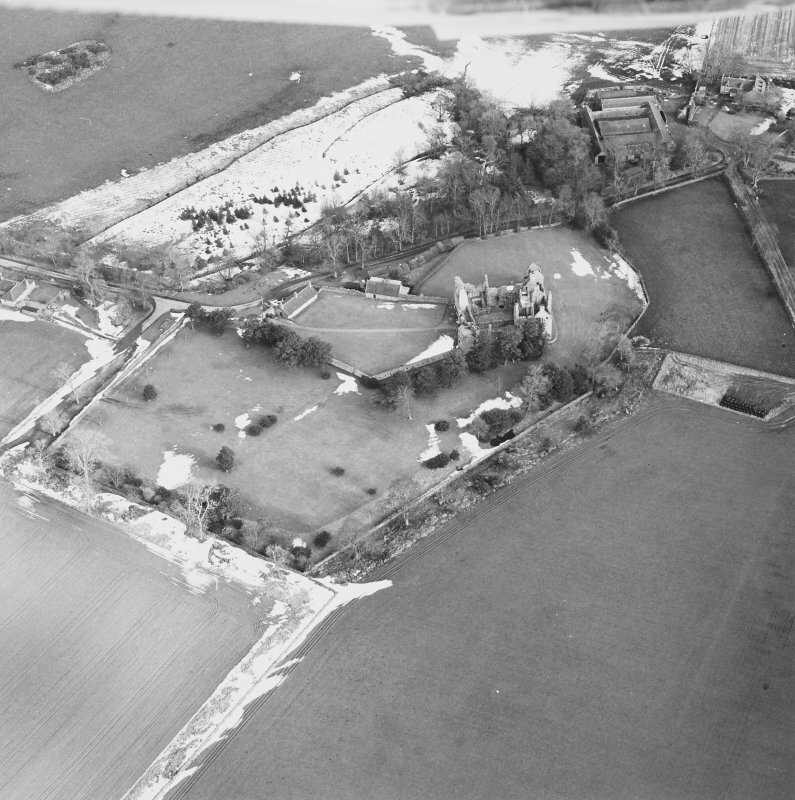 Oblique aerial view of Tolquhon Castle, looking SW.
Oblique aerial view of Tolquhon Castle, looking NNE. 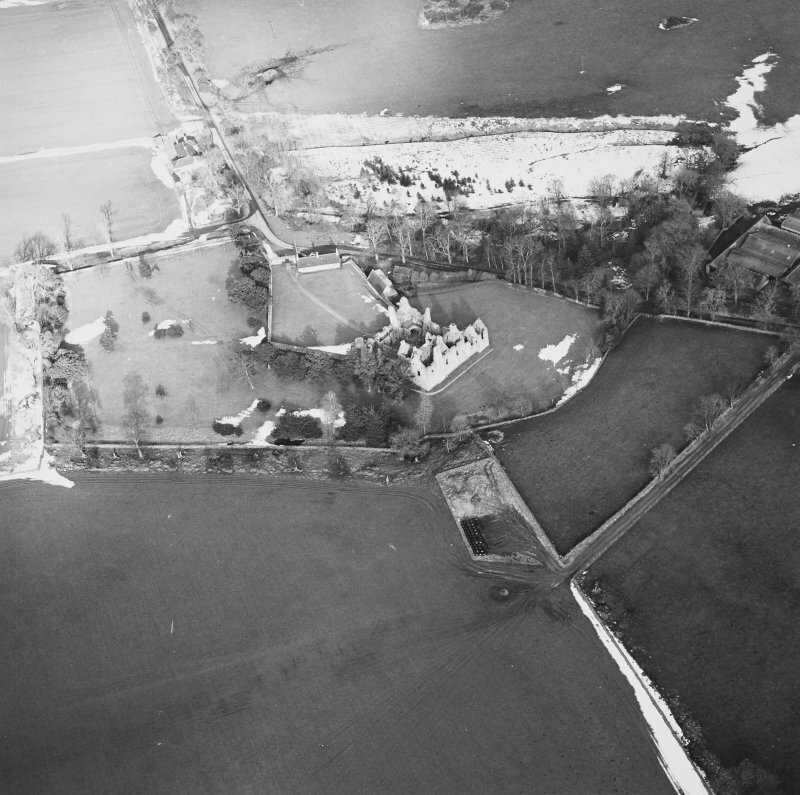 Oblique aerial view of Tolquhon Castle, looking NE. Oblique aerial view of Tolquhon Castle, looking S.
Oblique aerial view of Tolquhon Castle, looking WSW. View of SE angle of courtyard. 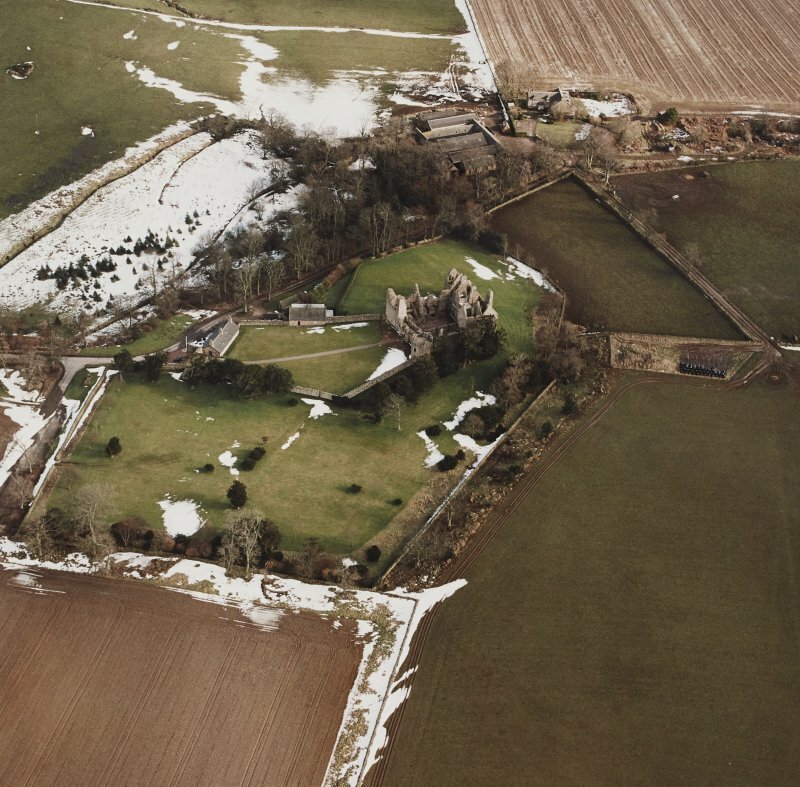 Oblique aerial view centred on the remains of the castle taken from the W.
châteaux of the Scots Renaissance. Very similar in sequence and plan to that other grand Forbes work, Pitsligo (see 'Banff & Buchan' in this series), it began with the Preston Tower, a dour rectangle with walls 71/2ft thick, now reduced largely to its vaulted ground floor. This functional block was enfolded within the courtyard plan of the new building created for the Renaissance man, Sir William Forbes. 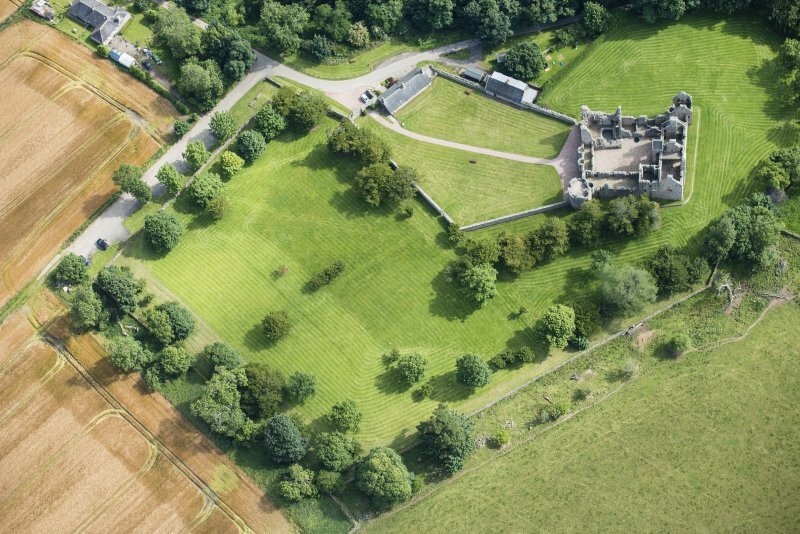 by enclosures; these enclosures, in the manner of Pitsligo, include a large hexagonal outer forecourt with 12 bee-boles in its wall, a walled garden to the north and a pleasaunce around the main mansion. For bronze vessels found near Tolquhon Castle (NJ 8728 2875), see NJ82NE 14. For possible building and pottery noted in 1989 watching brief (NJ 871 287), see NJ82NE 36. For 1996 watching brief (along access road at NJ 8728 2870), see NJ82NE 42. 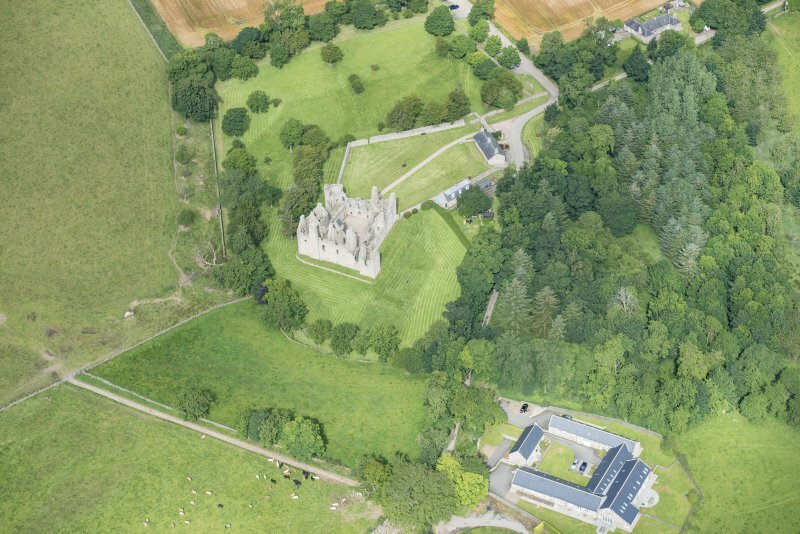 For Newseat of Tolquhon steading (NJ 8753 2955), see NJ82NE 49. Fully described in Official Guide, by Simpson (1948). Tolquhon Castle, as described and planned by Simpson. Visited by OS (RL) 6 April 1972. At Tolquhon a spacious, confident solution to the changed acommodation needs of a Renaissance laird can be seen. By 1584 the dour confines of the medieval Preston Tower, built in 1420 with walls 3m thick, no longer provided an adequate standard of accommodation for the cultured laird, William Forbes. 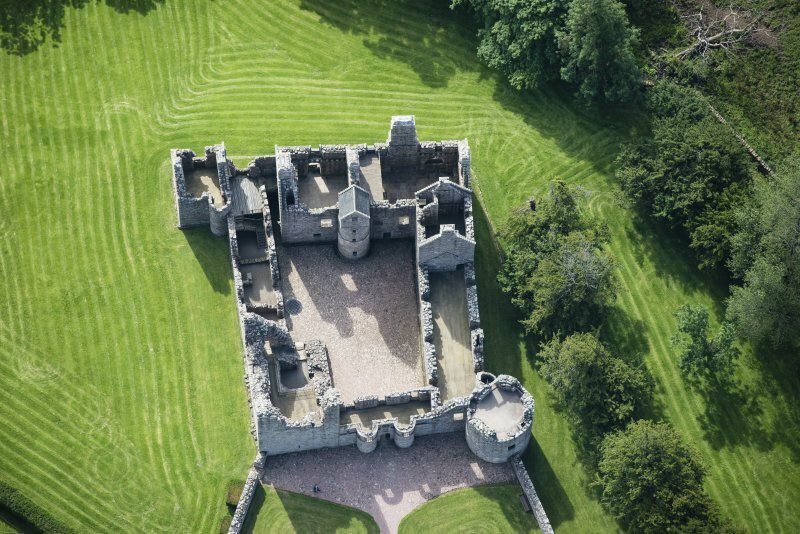 In that year he embarked on a radical 'new wark' (commemmorated on a tablet to the right of the gatehouse) consisting of four ranges set round an open courtyard. 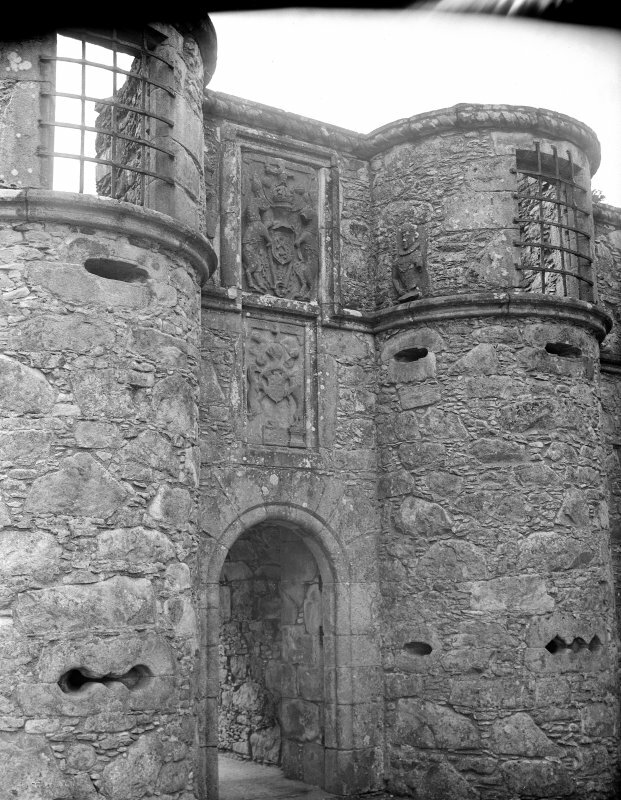 That this was the building of a new Renaissance man is seen first in the gatehouse which, with its thin walls, large windows and fanciful gun loops, is more a vehicle for displaying the Forbes and royal arms and a series of engaging sculptured figures than a serious defensive structure. The ranges that flank the inner courtyard were spacious and well appointed. The E range, incorporating the old tower, is the most ruinous; the S range, opposite the gatehouse, is a noble structure, once harled, with a little drum stair-tower bearing on the NW stone skew stone the initials of the mason, Thomas Leiper. The ground floor of this range contains extensive service quarters, including an interesting servery in the drum; above were the hall and private chamber of the laird. The first floor of the W and S ranges consists of a most legant gallery, in which the laird would have kept his books and retiring rooms for conversation. The furnishings must be imagined from an inventory of 1589; books, tapestries, panelling, artillery and furniture. 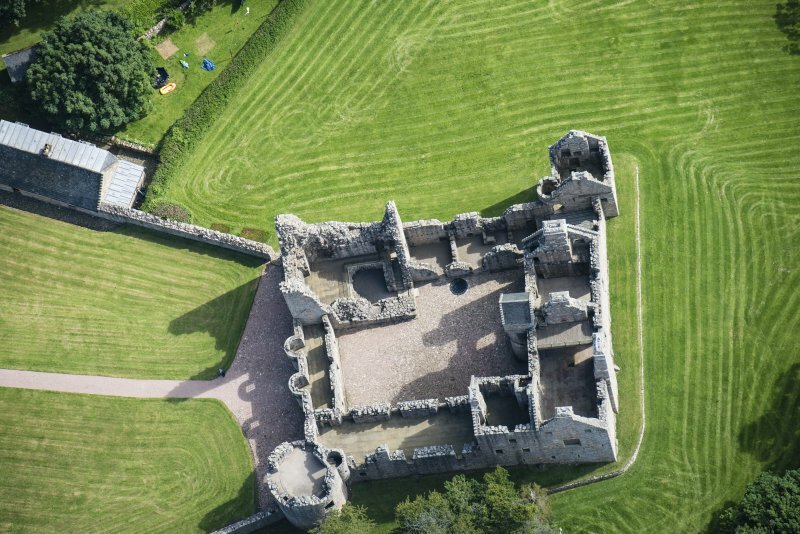 The grounds of the castle were not neglected, a pleasance being laid out on the W and S sides, while 12 bee-holes can still be seen in the forecourt wall. (NJ83SE 32), a fine memorial to the creator of Tolquhon. (Location cited as NJ 8725 2864: nominated as Site of Regional Significance). This incomplete building stands on a spur at an altitude of 100m OD. 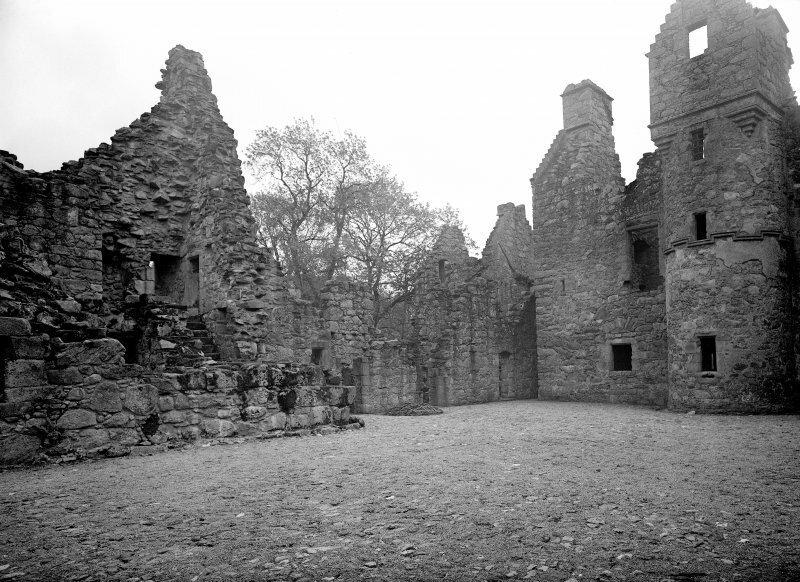 Excavation was carried out by Mrs M Greig in May 1989; archive with Historic Scotland. NJ 872 286 Scotia Archaeology Ltd carried out a watching brief during the excavation of two trenches, each 0.3m wide and 0.6m deep, for a new electricity supply on the N and S sides of the road leading from the B999 to the castle. Trench A ran NE-SW for a length of 8.7m, about 30m E of the Historic Scotland office and workshop block. 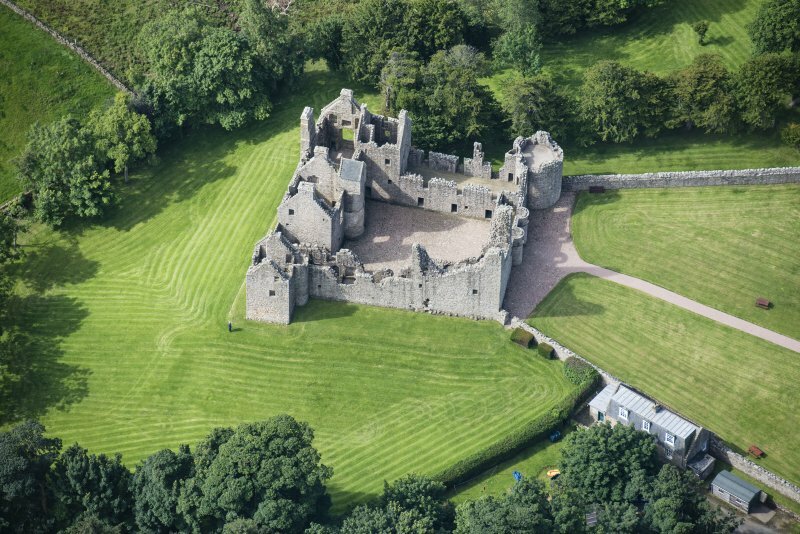 Cutting across the trench, towards its N end, were the remnants of a drystone wall, the probable predecessor of the N boundary wall of the castle forecourt. Nothing of archaeological interest was uncovered in Trench B. 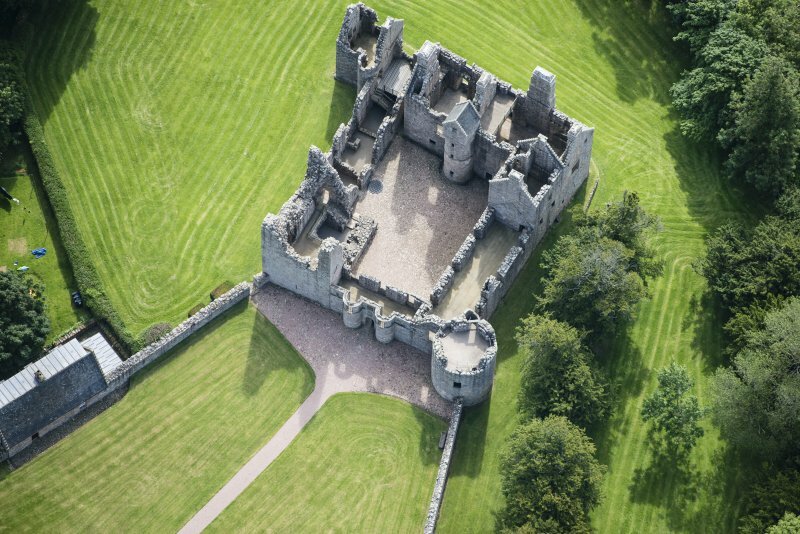 The monument comprises a castle and associated buildings of 15th and 16th century date. 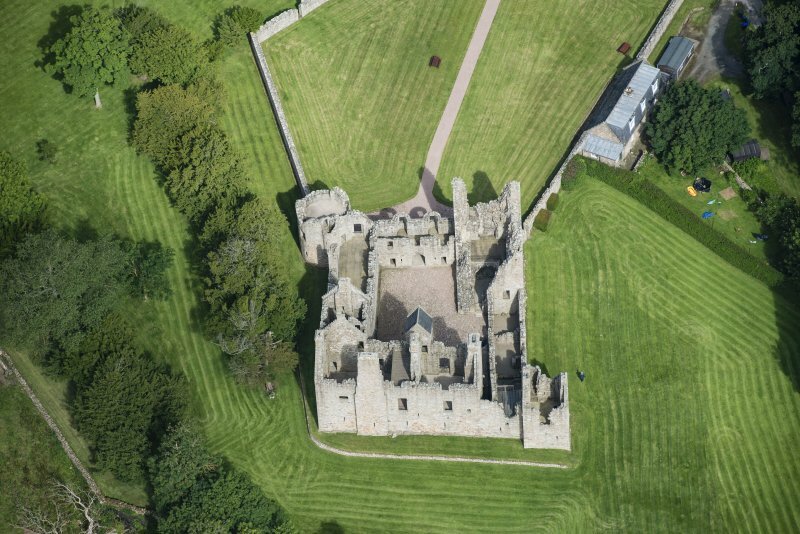 It is in the care of the Secretary of State for Scotland and comprises the remains of Tolquhon Castle, rebuilt between 1584 and 1589 by William Forbes, seventh laird of Tolquhon. 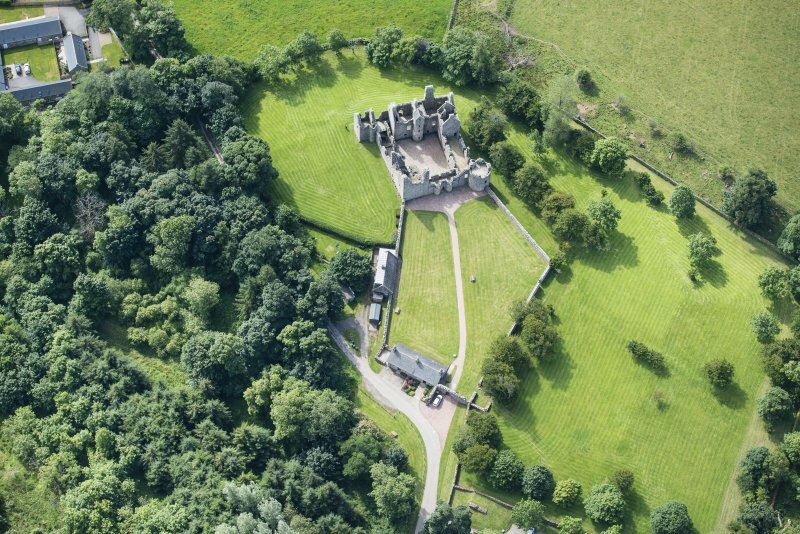 The castle incorporates Preston's Tower, which came into the possession of the Forbes family in 1420 when Sir John Forbes married Marjorie Preston, daughter of Sir Henry Preston, Lord of Formartine. 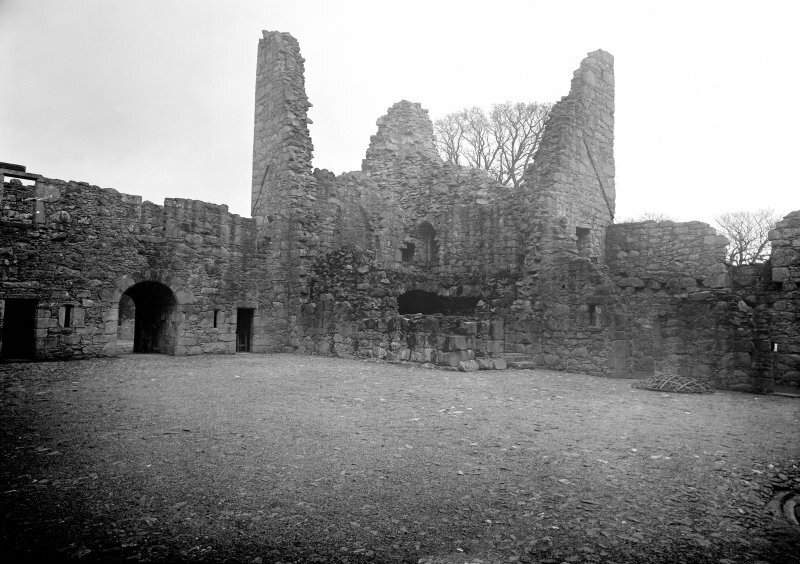 The 'tower and fortalice' of Tolquhon are mentioned in a charter of 2nd December 1536. Remains of early buildings associated with the tower may be expected to survive beneath the present land surface. 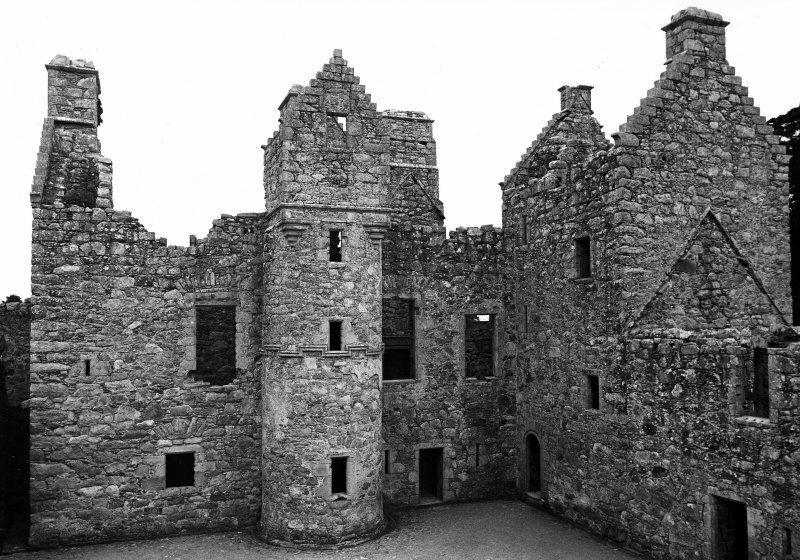 The tower continued as the main residence until 1584, when reconstruction of the castle began. 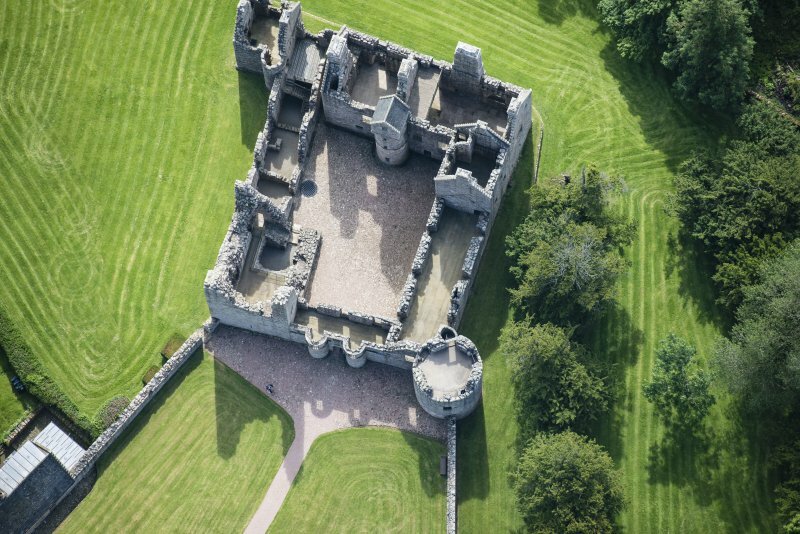 Tolquhon Castle consists of four ranges, enclosing a sub-rectangular courtyard within which is a well some 6m deep. At the NE corner of the inner court are the remains of Preston's Tower. Originally four storeys high, only the first floor and cellar remain. 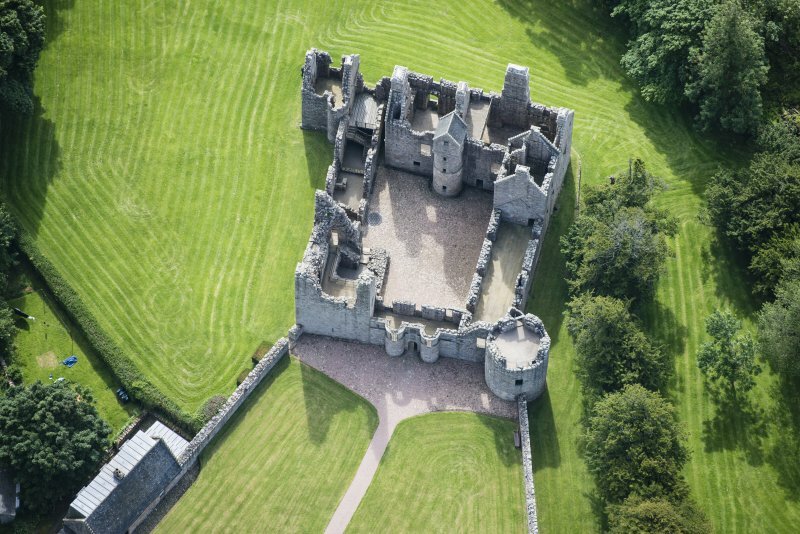 The walls measure some 3m thick, and are far more substantial than the walls of the later ranges of the castle. 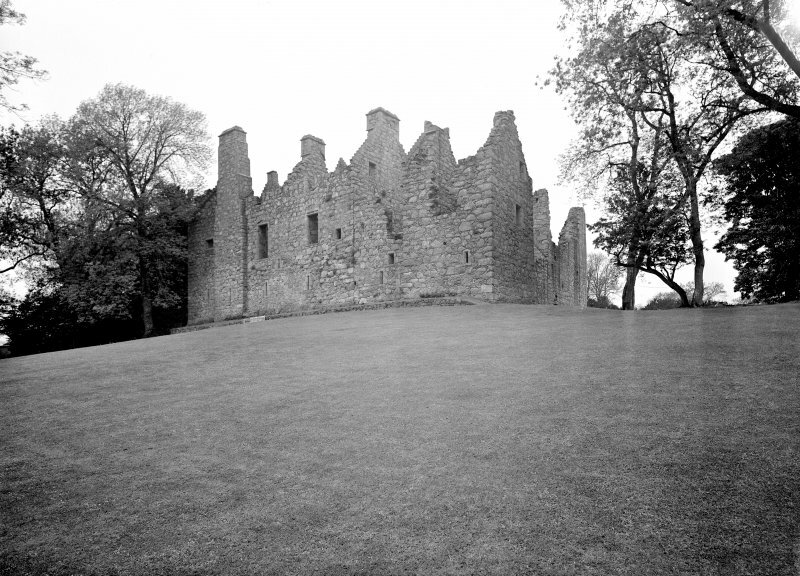 The east range of the castle is two storeys high, with walls measuring about 1m thick. It originally housed service rooms, including the bakehouse, at ground level, with living accommodation above. Behind the two brick domed ovens in the bakehouse was a pit-prison, reached through a hatch from the floor above. 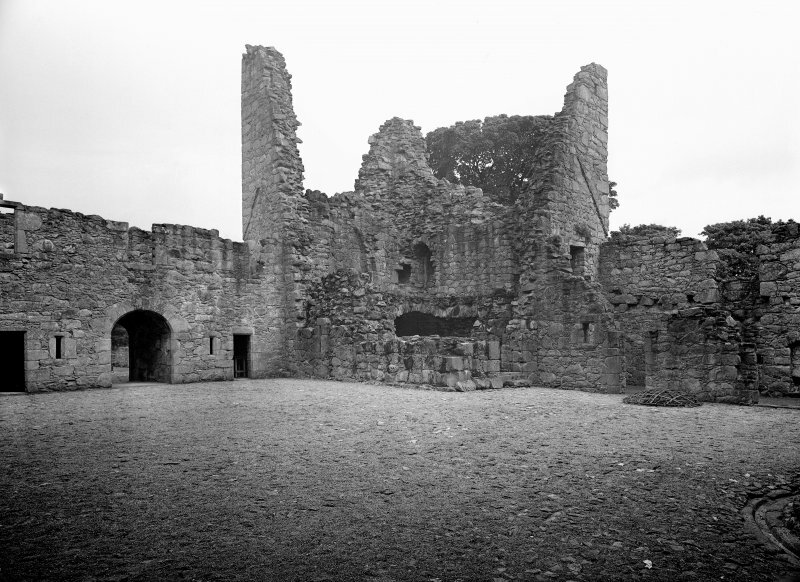 The W range of the castle, also two storeys high, had service rooms at ground level and a gallery on the upper floor where the family could exercise in bad weather. The gallery was also used as a place to hang family portraits and display treasured possessions. The main house lies at the south side of the inner court of the castle. The ground floor of its three storeys housed the kitchen and storage cellars. Three separate stairs link the ground and first floors. Two are narrow, for the use of the servants. The third is wider and more easily graded, giving access to the principal accommodation in the upper floors of the house as well as the gallery in the upper floor of the W range. 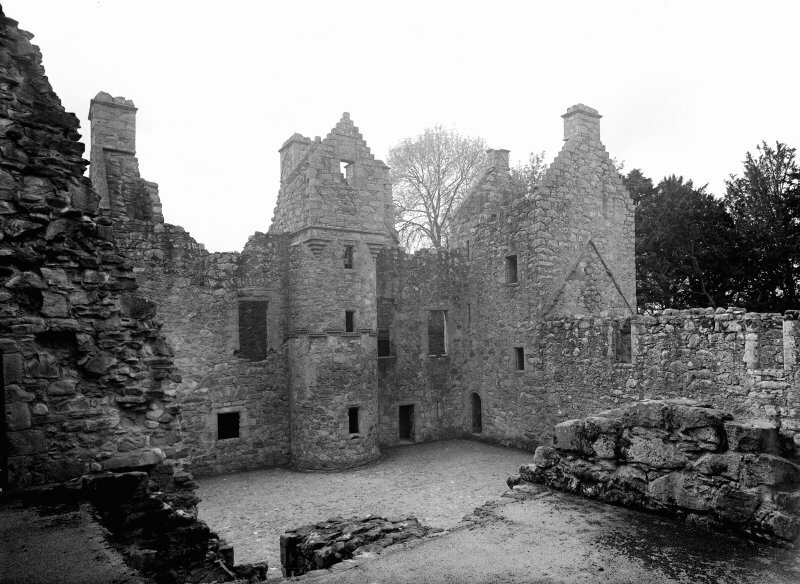 Within the upper floors of the main house are a number of rooms, the largest being an outer hall where most entertaining would have taken place. 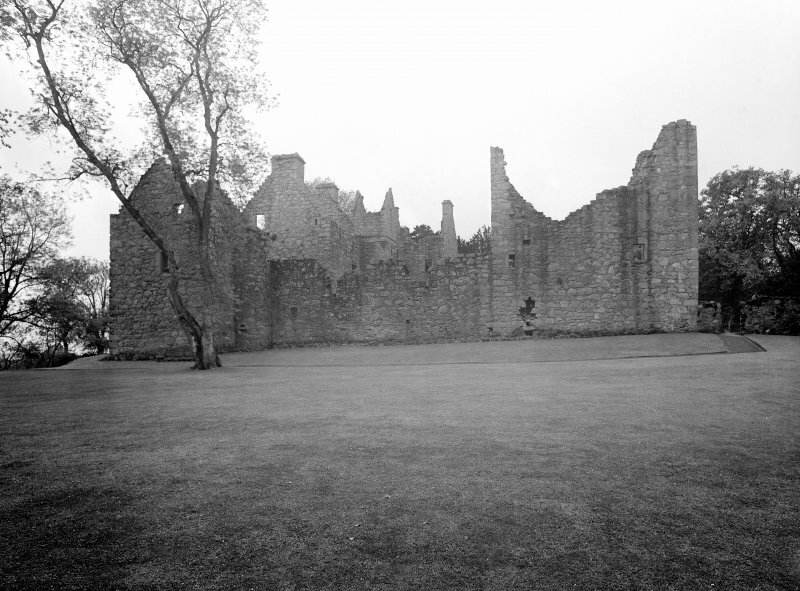 Next to the hall is a private chamber, above which is a room thought to have been the laird's bed-chamber. AL. THIS. WARKE. EXCEP. THE. AULD. TOUR. WAS. BEGUN. BE. WILLIAM. FORBES. 15. APRILE. 1584. AND. ENDIT. BE. HIM. 20. OCTOBER. 1589. 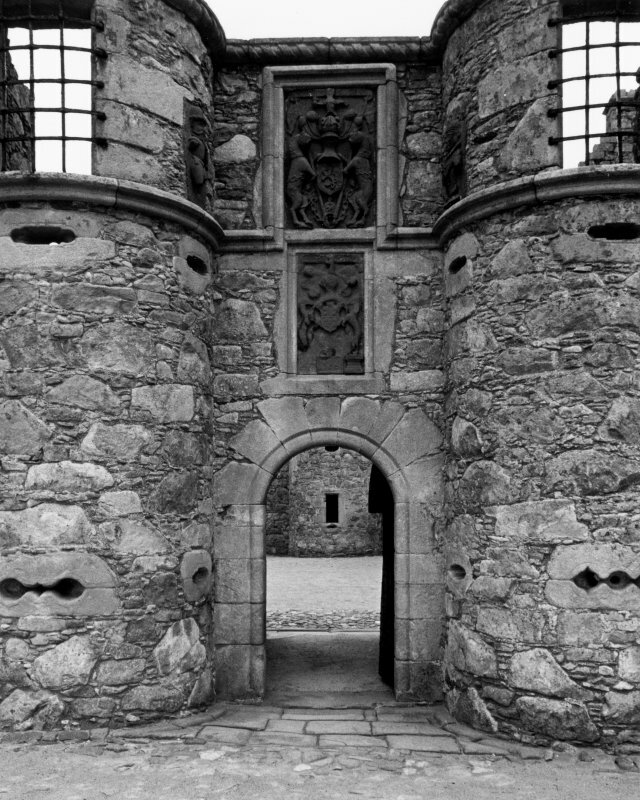 Across the outer court of the castle from the gateway is the outer gate, with triple gunloops on either side of the entrance. To the E of the outer gate, in the NE corner of the castle forecourt, are the foundations of a dovecot with seven surviving nesting boxes. The walls stand to a height of about 1m. 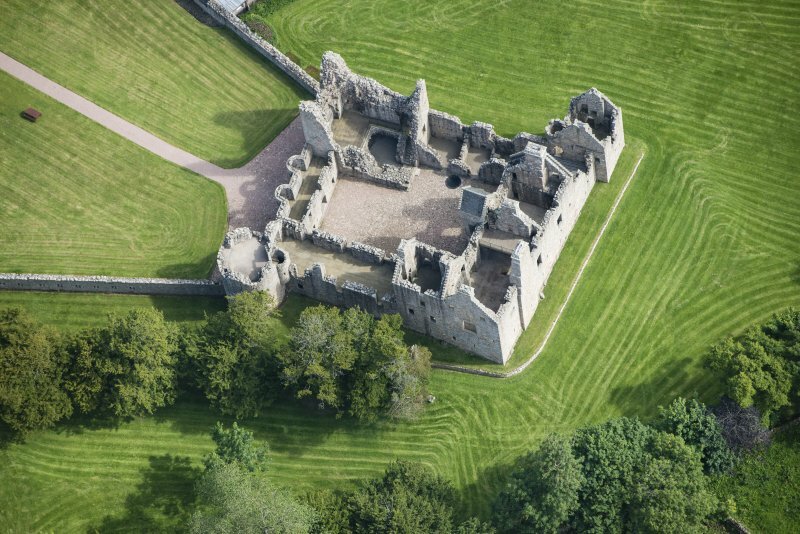 To the W of the castle and outer court lie the remains of a formal garden containing some old yews and the trace of former pathways. 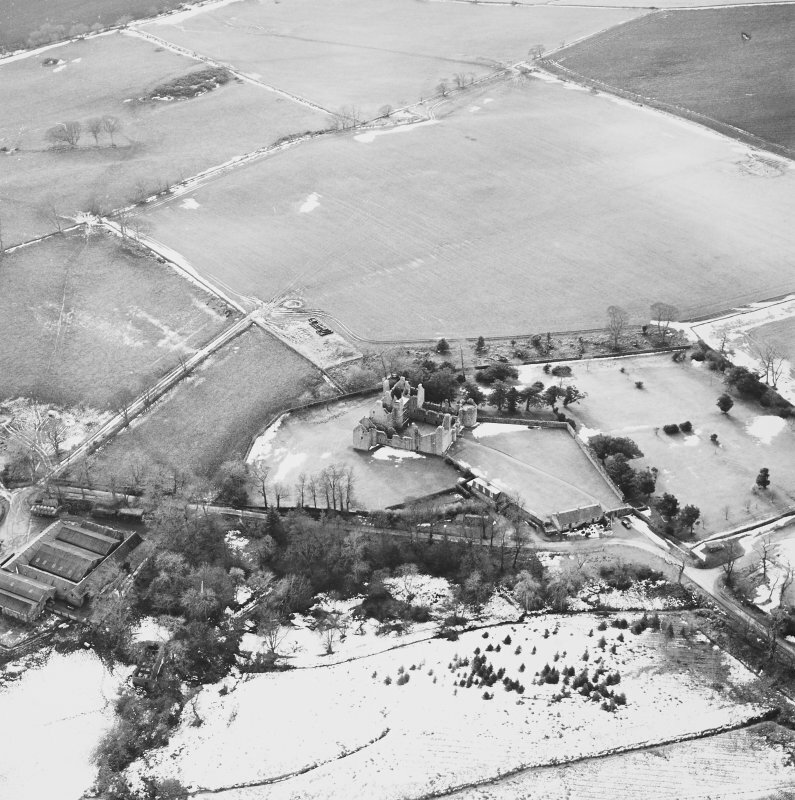 In 1716 the estate was sold to ease financial pressures on the Forbes family. 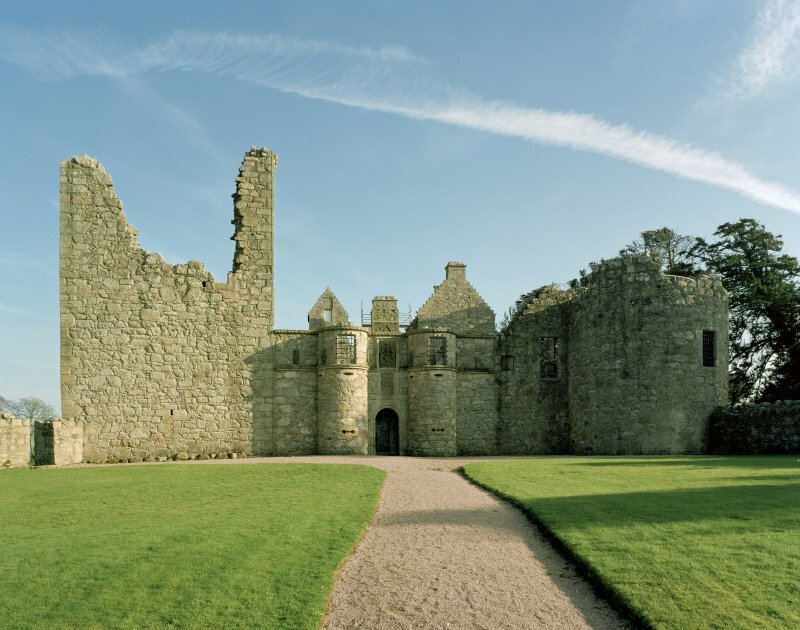 William Forbes, the eleventh laird, refused to abandon the castle, and was eventually wounded and dislodged from the castle on 5 September 1718. 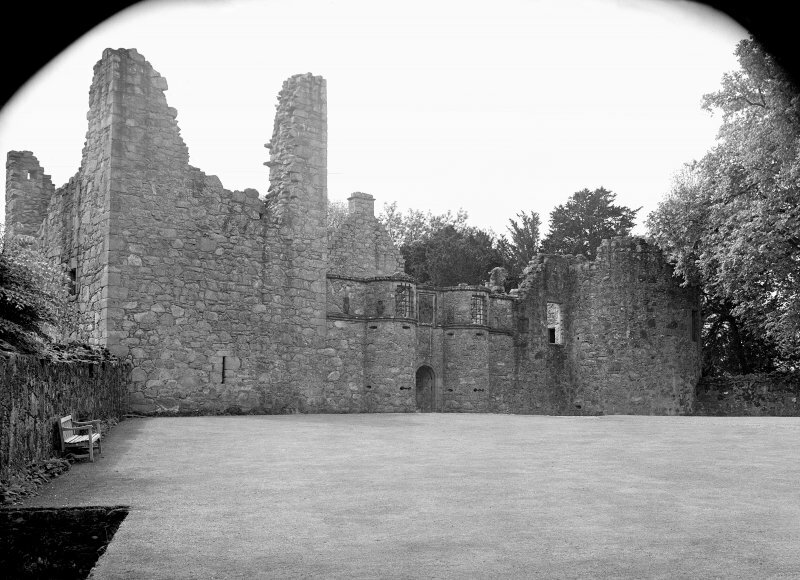 The estate was purchased by the Earl of Aberdeen, and the castle remained inhabited until the middle of the 19th century, after which the buildings fell into decay. Information from Historic Scotland, scheduling document dated 3 March 1999. NJ 872 286. 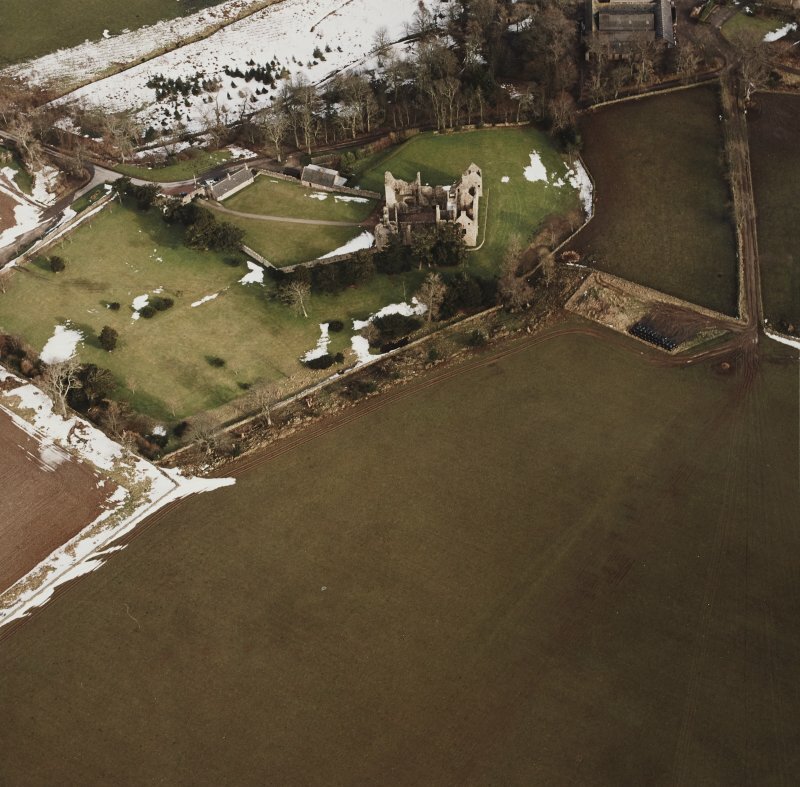 In July 1999 the digging of a trench for a telecom cable was monitored at Tolquhon Castle (NMRS NJ82NE 1). This trench was to connect the custodian's cottage with the cottage next to the gatehouse, now used as the entrance and shop for the castle -a distance of some 41m. The trench was hand-dug. Below topsoil was a rubble-filled loam, full of slates, ceramic drainpipe fragments, etc. This sealed an area of apparent cobbling pressed up against the wall, some 105cm wide, constructed of half a dozen split granite cobbles laid flat, and pressed down into a deposit of light brown fine silt which continued W beyond the cobbling, until truncated by the cut for the pipe. This produced no finds, and averaged 30cm thick before bedrock was encountered. There is no change to the existing record. Information from RCAHMS (JRS), 27 October 2003. Plans:- Aberdeen School of Architecture - Measured by Stephen Sutherland & Peter Leask 1923-9. 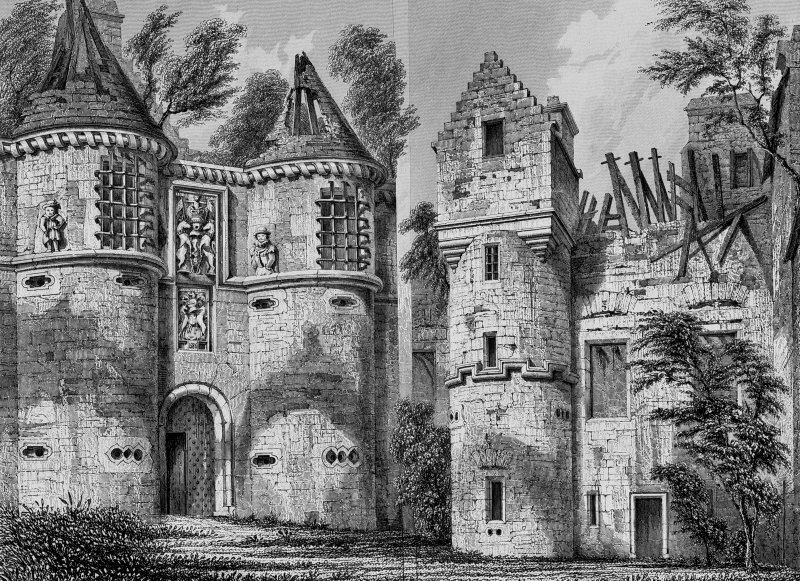 That this was the building of a new, Renaissance man is seen first in the gatehouse which, with its thin walls, large windows and fanciful gun loops, is more a vehicle for displaying the Forbes and royal arms and a series of engaging sculptured figures than a selious defensive structure. The ranges that flank the inner courtyard were spacious and well appointed. 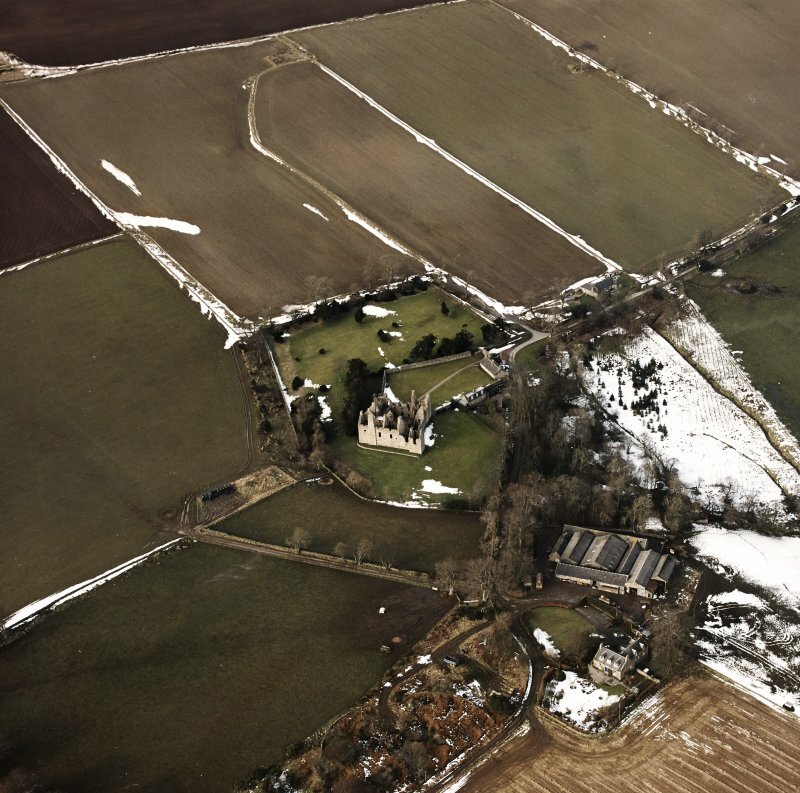 The east range, incorporating the old tower, is the most ruinous; the south range, opposite the gatehouse, is a noble structure, once harled, with a little drum stairtower bearing on the north-west skew stone the initials of the mason, Thomas Leiper. The ground floor of this range contains extensive service quarters, including an interesting servery in the drum; above were the hall and private chamber of the laird. The first floor of the west and south ranges consists of a most elegant gallery, in which the laird would have kept his books, and retiring rooms for conversation. The furnishings must be imagined from the inventory of 1589- books, tapestries, panelling, artillery and furniture. 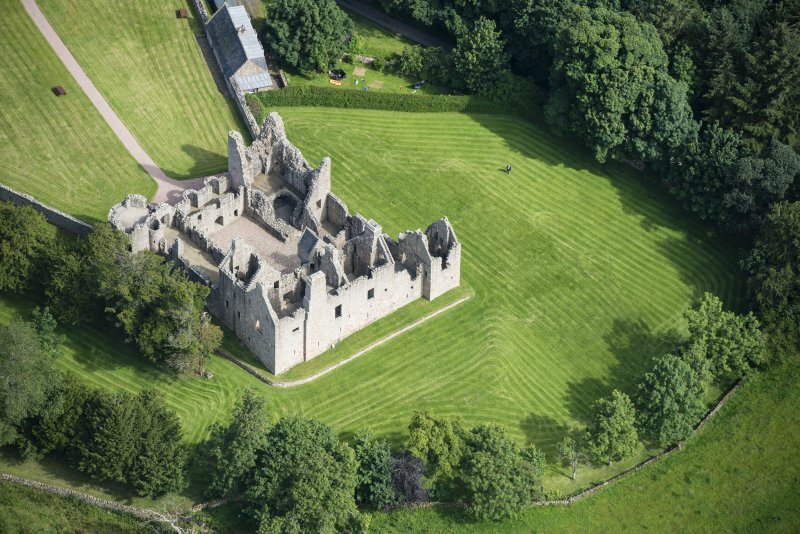 The grounds of the castle were not neglected, a pleasance being laid out on the west and south sides, while 12 bee-boles can still be seen in the forecourt wall. William Forbes died soon after his 'new wark' was completed. His tomb can still be seen in Tarves kirkyard (no. 43), a fine memorial to the creator of Tolquhon. 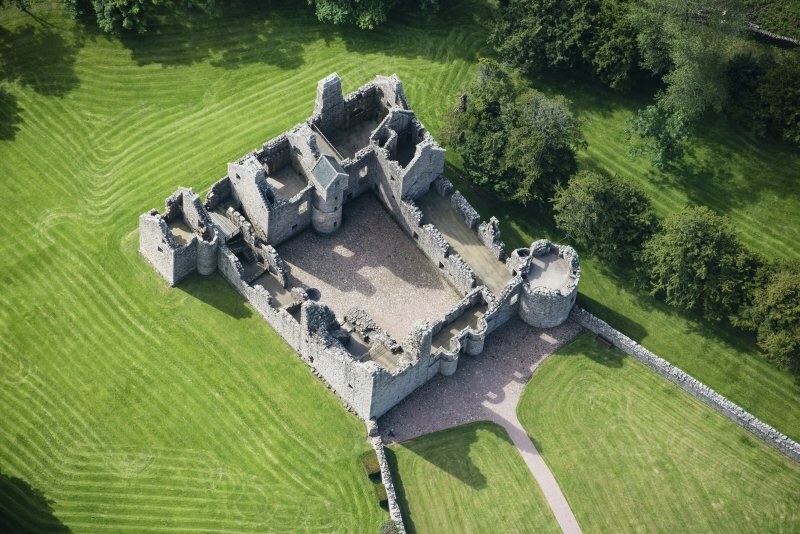 At Tolquhon a spacious, confident solution can be seen to the changed accommodation needs of a Renaissance laird. By 1584 the dour confines of the medieval Preston Tower, built in 1420 with walls 3m thick, no longer provided an adequate standard of accommodation for the cultured laird, William Forbes. 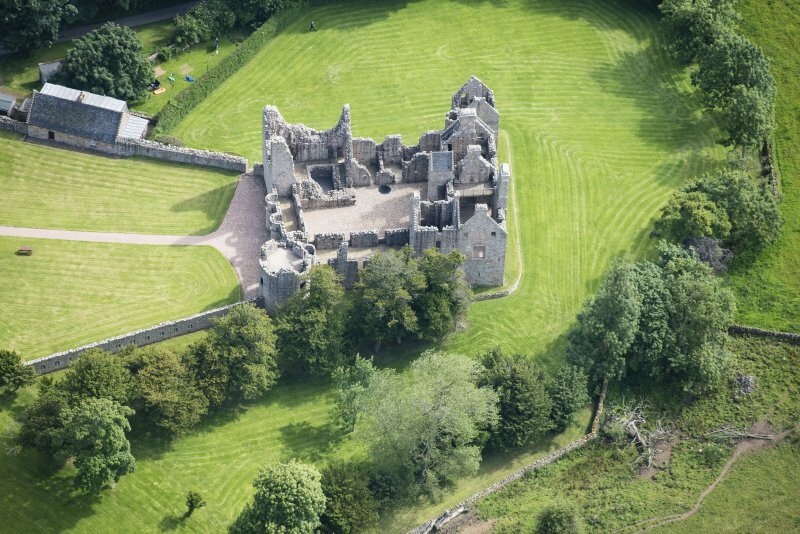 In that year he embarked on a radical 'new wark' (commemorated on a tablet to the right of the gatehouse), consisting of four ranges set round a courtyard. 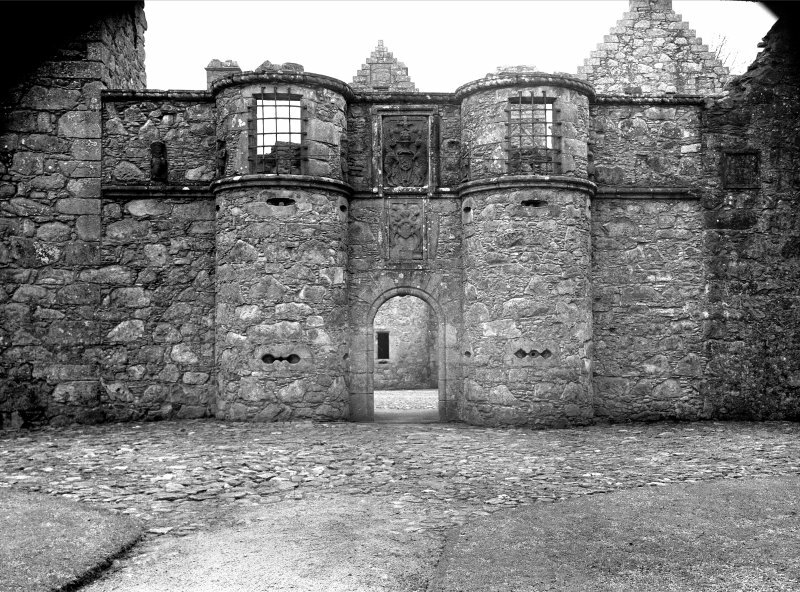 That this was the building of a new, Renaissance man is seen first in the gatehouse which, with its thin walls, large windows and fanciful gun loops, is more a vehicle for displaying the Forbes and royal arms and a series of engaging sculptured figures than a serious defensive structure. The ranges that flank the inner courtyard were spacious and well appointed. 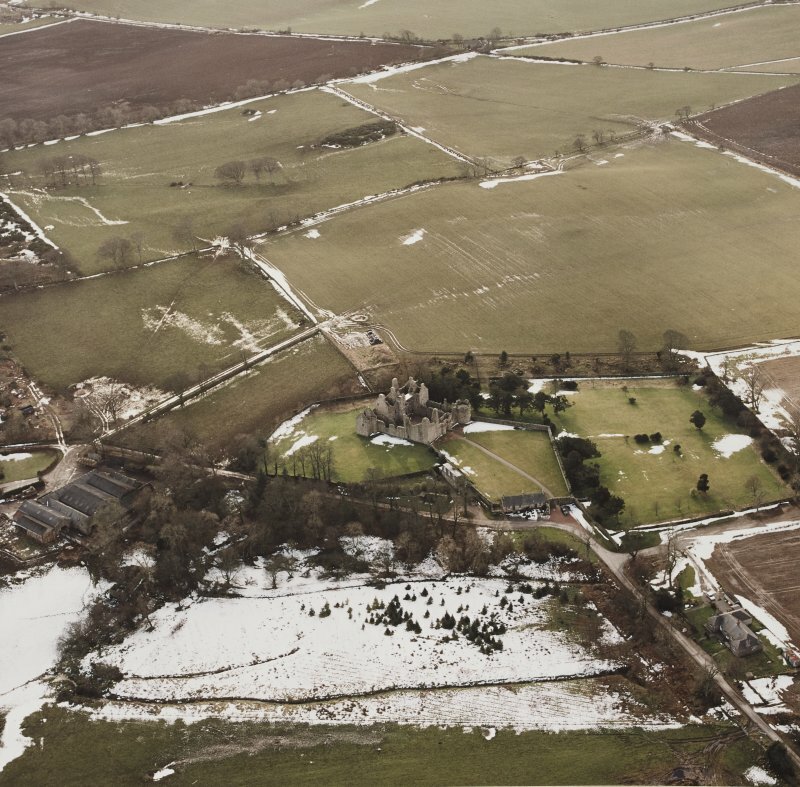 The east range, incorporating the old tower, is the most ruinous; the south range, opposite the gatehouse, is a noble structure, once harled, with a little drum stair-tower bearing on the north-west skew stone the initials of the mason, Thomas Leiper. 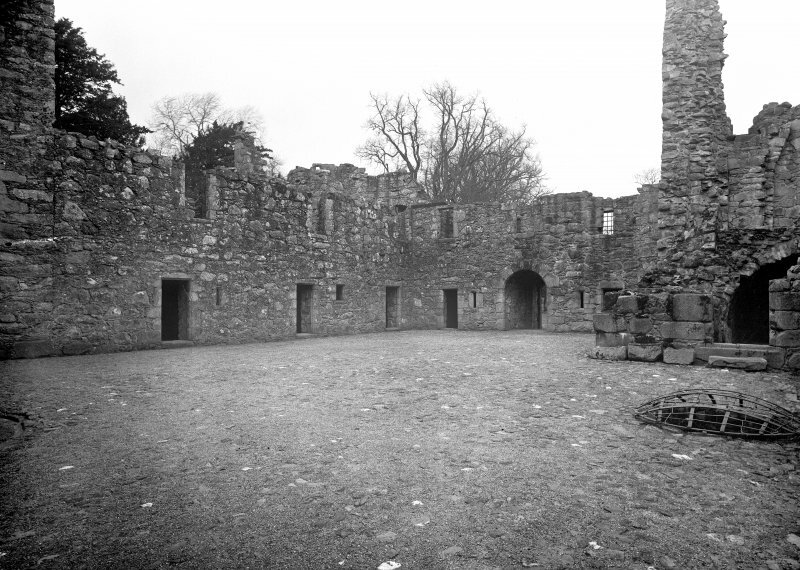 The ground floor of this range contains extensive service quarters, including an interesting servery in the drum; above were the hall and private chamber of the laird. The first floor of the west and south ranges consists of a most elegant gallery, in which the laird would have kept his books, and retiring rooms for conversation. The furnishings must be imagined from the inventory of 1589-books, tapestries, panelling, artillery and furniture. 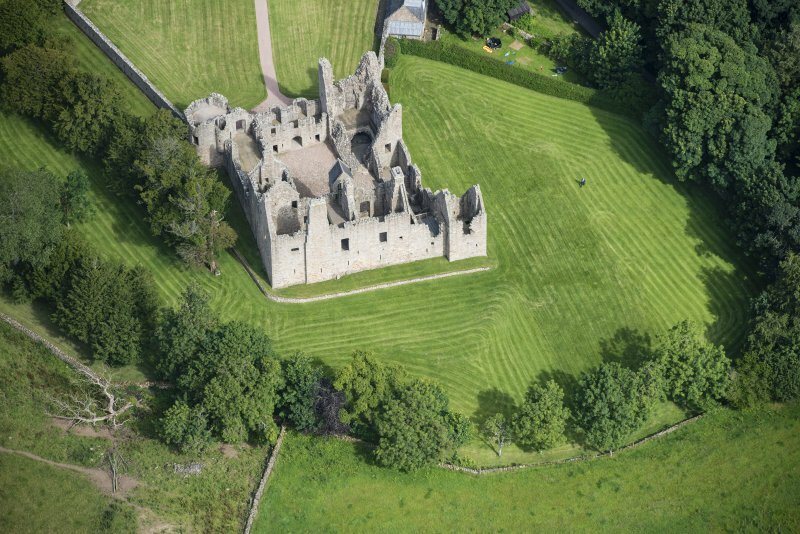 The grounds of the castle were not neglected, a pleasance being laid out on the west and south sides, while 12 bee-boles can still be seen in the forecourt wall. A very similar arrangement of a Renaissance palace-plan wrapped round an earlier tower and graced by garden enclosures can be seen at Pitsligo (Nj 927669). 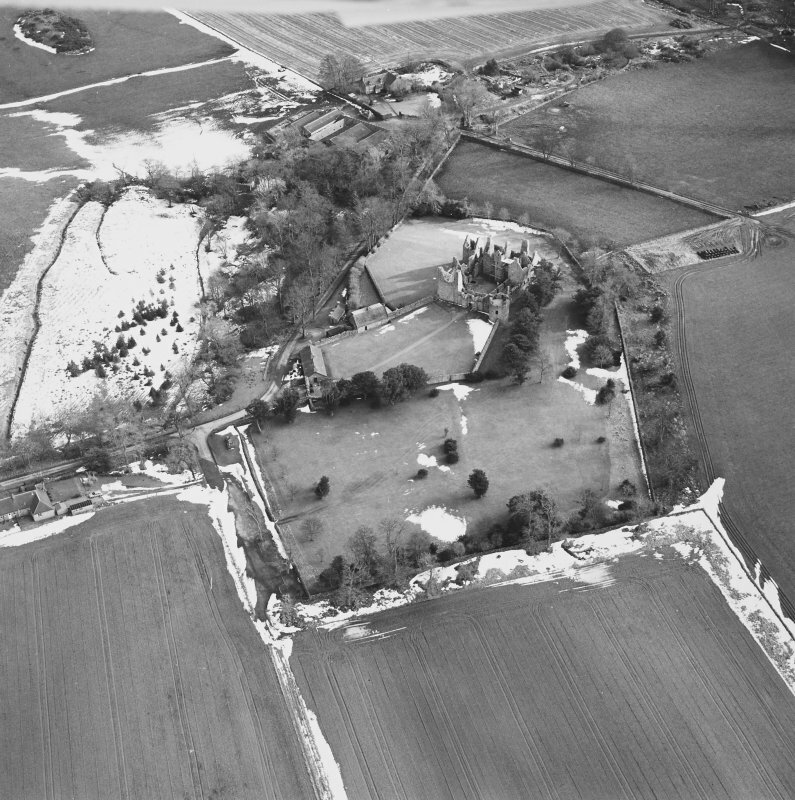 Between the 19th-20th July 1999, Kirkdale Archaeology were asked to monitor the digging of a trench for a telecom cable at Tolquhon Castle. This trench was to connect the Custodian's cottage with the cottage next to the Gatehouse, now used as the entrance and shop for the Castle, a distance of some 41m. The area to be dug was split by a wall running NW from the corner of the custodian's cottage, with 17m of the trench being to the W of this wall, and the last 14m running parallel to the E side of it. The trench was hand dug, varying between 25-30cm wide, and 40-50cm deep. Below topsoil was a rubble filled loam, full of slates, ceramic drainpipe fragments, etc. some 20cm thick. This sealed an area of apparent cobbling pressed up against the wall, some 105cm wide, constructed of half a dozen split granite cobbles laid flat, and pressed down into a deposit of light brown fine silt which continued W beyond the cobbling, until truncated by the cut for the pipe. This produced no finds, and averaged 30cm thick before bedrock was encountered. At the wall itself, the cable was to be fed through an extant gunloop, which was some 17cm above the cobble surface, so this was left in situ, with the cable to be laid directly over it. NJ 8724 2871 A watching brief was carried out on 28 February 2011 during the excavation of a drainage trench within the forecourt on the N side of Tolquhon Castle. Most deposits seen probably related to recent work, but some may be remnants of the earlier garden layout.